Even though I’ve only spent a couple of short months in a real hustle-and-bustle newsroom and never at a major paper, I still get really amped when I watch movies about that kind of setting. It takes me back to when I worked for my college paper—the Spotlight team’s tiny room sectioned off from the rest of the staff made me nostalgic for our tiny computer lab in the basement of the student union, heavy with the scent of newsprint and stale coffee. Spotlight truly deserved its Best Picture win—what a powerful film. As a journalist, I easily related to their passion for the story, their sense of duty to discover the truth and unveil it to the world. As a former Catholic school kid, the statistics were staggering. 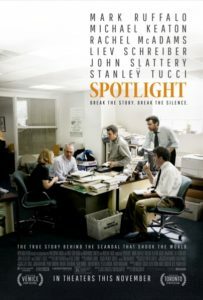 Based on true facts, Spotlight tells the story of how The Boston Globe exposed the wide-spread scandal of pedophilic priests and the massive cover-up within the Catholic Church. It hit the front page of the Sunday paper in early 2002 and sent shockwaves around the country—and, as the end credits show, the world. If you enjoy journalism movies or are interested in the subject matter. I highly recommend it. It’s official; I have been sucked into the world of Divergent. I always do this. I ignore something as the buzz builds and builds, and when it finally reaches a deafening roar, I break down. I did it with Harry Potter, believe it or not. When my mom first brought the Sorcerer’s Stone home for me, I thought it looked silly. Flash forward 14 years and I’m sitting in a movie theater sobbing my heart out as a gigantic chunk of my childhood finally comes to an end. The Hunger Games: Not quite as dramatic, but still the same result. I resisted until maybe a month or so before the movie, then finally read the book, nay, the entire trilogy, in one weekend. And now I love it. So when everyone started talking about Divergent, I knew I would eventually have to grab the book, since I’m the type of person who simply has to read the book before seeing the movie. ☆NSYNC jumps on the reunion bandwagon?